Homepage PETS Dog etiquette in France !! Dogs are « les rois et les reines » in France. They are widely loved and you will strike up conversations with the least likely of strangers regarding your pooch’s character, eating habits which are a lifetime obsession in France and looks (because even animals should be esthetically pleasing to the eye of course)! 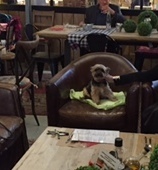 It is not strange to see dogs in restaurants and even busy waiters will bring out water for your four legged friend without a complaint to be heard, this however may not be the case if you ask for the extra cup of coffee though!!! But while furry friends are accepted almost everywhere God forbid if they jump on people and ruin their elegant clothing!! 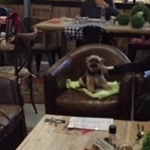 There will be a lot of ‘oh la la, elle est encore jeune” which directly translates as she is still young” which indirectly means, that obviously she has not yet had the education that is expected of adult French dogs. You will often hear the same phrase when your child stares at their feet instead of saying ‘Bonjour Monsieur or Madame” as they are required to do from as soon as they can speak. And don’t take it personally if a French dog owner is displeased if you show too much enthusiasm about their dog, they just want to ensure that their dog doesn’t embarrass them by getting all excited. But like French children, French dogs seem to know when and where they are expected to behave!